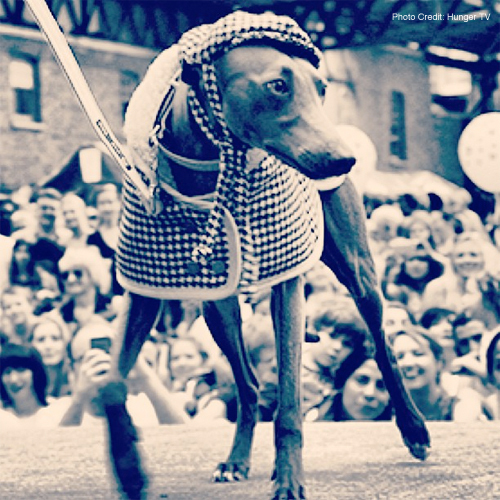 The Paw Pageant is LoveMyDog’s annual fundraising event for the Battersea Dogs & Cats home. Taking place over the August Bank Holiday Monday (25th August) at London’s Old Spitalfields Market, this year’s Paw Pageant promises to better than ever. A host of doggy dudes are donning couture designer fashions to raise funds for Battersea while paw-struck celebrities gaze on. The catwalk show starts at 1pm, so please be sure to arrive early to get your seats! Dapper dogs will dazzle the crowds in divine creations from the queen of canine couture, Lilly Shahravesh of LoveMyDog. Each paw-fect pooch will be accompanied on stage by a human consort, modelling collections by NW3, Oliver Bonas, Albam, Jigsaw Menswear, Hackett, Traffic People, Jones and Jones and Shoe Embassy. Battersea Dogs and Cats Home will be on site to provide free microchipping and dog tagging to all pet owners. We will also be running a competition where one lucky pooch will win the latest A/W LoveMyDog Collection set. Dog Entries for the pageant: The fund raising event is free to attend but if you’d like enter your dog in the Paw Pageant which takes place after the catwalk show there are costs of £8 pre-registration or £10 on the day. (We recommend you pre-register to avoid disappointment on the day due to the high demand). Paw Pageant registration desk will be open from 11.30 am to 13.00 pm only. All proceeds go towards Battersea Dogs & Cats Home. To register your pooch contact Nova by emailing novadonohoe@wellingtonmarkets.co.uk.